Celeriac makes a great doorstop. 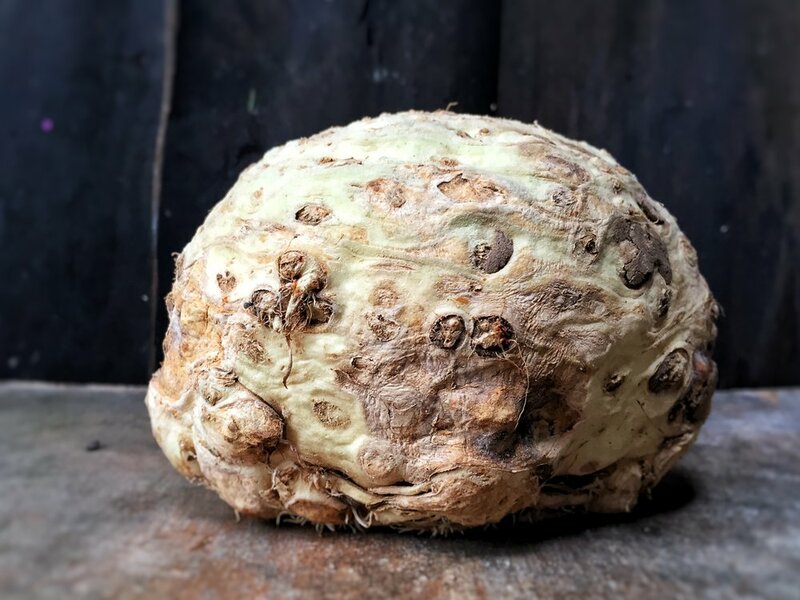 If you have some time and patience on your hands (which you must be prepared to shred on the mandoline), a remoulade is another, and tastier way, to use this boulder of a root vegetable. It's earthy celery taste, crunchy against the creamy dressing sit very well with the soft, rich sweetness of seared scallops. I like to add a pinch of chilli and curry spices to liven things up, but you could equally make this with paprika or just simply seasoned with salt and pepper. I've used the zest of a lemon, shredded among the celeriac to give a little zing. Apple and caper would make a welcome appearance if you felt like going a step further. Whatever you do, let the remoulade rest for about half an hour to soften a little before serving simply on toasted sourdough. Method Set aside the morning to peel the celeriac. Or just use a knife to pare away the skin. Using a mandoline with a fine julienne attachment, shred the celeriac into a bow trying to leave as much skin on your fingers as possible. If you don't have a mandoline, you can grate the root or slice it with a knife, but to be honest, life is too short. Do something else. Mix the shredded root with the lemon juice then stir in the rest of the ingredients and leave to sit for 30 minutes. Heat a griddle pan and toast the sourdough bread with a dash of olive oil and set aside. Heat a sauté pan with the coconut oil, season the scallops and sprinkle with the curry powder. Sear each one for about a minute each side, basting with the oil as you go. Serve the remoulade on the toast topped with the scallops and a pinch of chilli flakes.